Japan is over 70% mountainous terrain with approximately 18% land mass suitable for human settlement. Japanese cities are typically sprawling and densely populated. 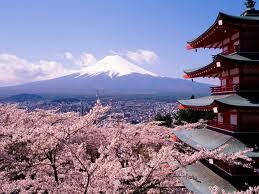 Tokyo, a megalopolis and the capital of Japan, is located on Honshu island. Central Tokyo has a population of 12 million people, with the population of the Greater Tokyo Area estimated at over 35 million people. Raw horse meat is a popular entree in Japan. Sliced thinly and eaten raw it is called basashi. A musk melon (similar to a cantaloupe) can sell for over 31,473 yen ($300.00). There are vending machines in Japan that dispense beer! Animated Japanese films and television shows (.i.e. : Anime) account for 60% of the world’s animation-based entertainment. So successful is animation in Japan, that there are almost 130 voice-acting schools in the country. 21% of the Japanese population is elderly, the highest proportion in the world. In the past, the Japanese court system has had a conviction rate as high as 99%! Japanese prisons (as of 2003) operated at an average of 117% capacity. Raised floors help indicate when to take off slippers or shoes. At the entrance to a home in Japan, the floor will usually be raised about 6 inches (15.24 cm.) indicating you should take off your shoes and put on slippers. If the house has a tatami mat room, its floor may be raised 1-2 inches (2.54-5.08 cm.) indicating you should take off your slippers. Japanese people have an average life-expectancy that is 4 years longer than Americans. Some men in Japan shave their heads as a form of apology. Japan has the second lowest homicide rate in the world, but is also home to the extremely spooky suicide forest, aokigahara. Japan has produced 15 Nobel laureates (in chemistry, medicine and physics), 3 Fields medalists and one Gauss Prize laureate. Younger sumo-wrestlers are traditionally required to clean and bathe the veteran sumo-wrestlers at their wrestling “stables”. Japan’s unemployment rate is less than 4%. “Tetsuo: Iron Man” (no relation to the comic book, or Robert Downey, Jr. film), a relatively popular, extreme, “Cyberpunk” film (a “cyberpunk” film is a science fiction film that involves technology – and the abuse thereof – and social unrest), was based on a play the director Shinya Tsukamoto wrote and directed in college. A Paleolithic culture from about 30,000 BC is the first known inhabitants of Japan. Prolific Japanese film-maker Takahi Miike made up to 50 films in a decade during the peak of his career. my homepage Cool Funny Crazy Awesome Anime Facts which are never shared elsewhere.